MOSCOW, November 6. /TASS/. Russia’s new T-14 Armata tank represents “the most revolutionary step change in tank design in the last half century,” says a leaked report of the British military intelligence obtained by The Sunday Telegraph newspaper in London. 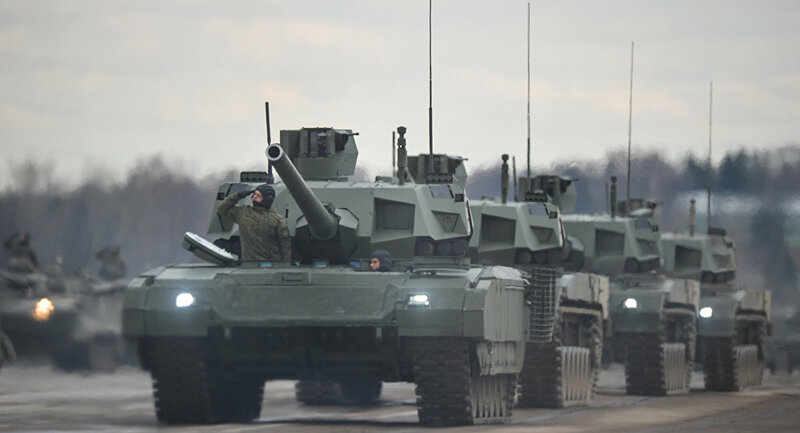 “Without hyperbole, Armata represents the most revolutionary step change in tank design in the last half century,” writes the author of the document, whom the newspaper identifies as a senior Army intelligence officer. A sample of T-14 Armata had the first public presentation at the May 9 military parade in Moscow in 2015 and its rollout there prompted the intelligence service to provide the report. The document profiles the T-14’s as ‘pioneering’ thanks to a revolutionary unmanned turret that makes the crew less vulnerable to enemy fire. In addition, the Armata has a gun with a higher muzzle velocity than that of the closest Wester analogues and is likely to be fitted out with an upgraded missile system, as well as a radar system installed at present on the overhauled Russian fighter jets. “As a complete package, Armata certainly deserves its billing as the most revolutionary tank in a generation,” the report says. “Secondly, it appears to be the first tank designed from the outset with an active protection system, to intercept incoming anti-tank guided missiles and shoulder-launched anti-tank weapons,” he said. “This has the potential to greatly reduce the firepower of Nato infantry,” Barry said. “Of course, there are few Armata yet, and it is not clear how rapidly they will enter service. But as they do, they will increase the effectiveness of Russian armoured forces.”. Russia’s 21ct century T-14 Armata battle tanks have commenced combat tests displaying their unique features on firing ranges. The T-14 Armata, rolled out for the first time during the 2015 Victory Parade in Moscow, brandishes a constellation of characteristics which make it an author of a new chapter in the battle tank industry. Thanks to stealth technology, the machine is practically invisible in infrared and other spectrums. It is equipped with an active electronically scanned array (AESA, or active phased array radar, APAR) similar to the one designed for Russia’s T-50 PAK FA 5th generation aircraft. The radar and cameras are meant not only for combat against an enemy but also for reconnaissance and fire adjustment. The tank’s armament includes a 125mm smoothbore cannon and a 7.62mm remote-controlled machine gun. In the future the tank can be transformed into a heavy self-propelled gun with a 152mm weapon.But the Armata’s technology stretches way beyond the T-14. The platform serves as a basis for the T-15, a heavy infantry fighting vehicle which will be augmented with a drone. A pilotless, robotic version of the tank is also envisaged. In addition, Russia intends to develop a tank support fighting vehicle dubbed the Terminator-3 using the Armata platform. Moreover, the Koalitsiya-SV self-propelled gun is expected to be upgraded with this platform. Twenty-eight vehicles are planned to be built using the Armata concept altogether.The Armata tank’s main feature is its unmanned turret. The crew of three is seated in an armored capsule in the hull’s front, which is separated from the stowage area. This construction gives the crewmen a greater chance of survival if the tank’s ammunition explodes. The armored capsule, unmanned turret, an APAR radar and active defense weapons make the T-14 Armata a unique vehicle capable of intercepting all kinds of currently operational anti-tank arms. This cascade of characteristics makes the T-14 Armata nearly invincible on the battlefield. India, China, Egypt and several other countries have queued up for the T-14. But the Russian Army’s needs remain a priority. The first batch of 100 tanks will enter service next year and 2,500 vehicles will join the Army by 2025, according to the Defense Ministry.